Frizzles reportedly originate from Southern Asia, the Philippines and Java around 300 years ago but examples were actually documented in Europe in 1676. 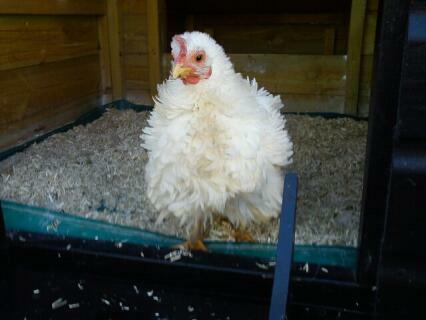 These only had frizzled wings and neck hackles though. 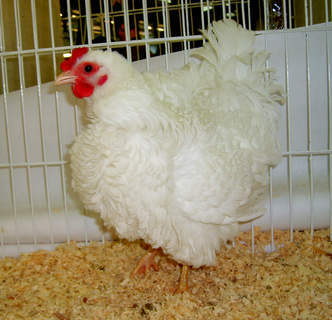 The breed is very popular for exhibition, usually in the bantam form. 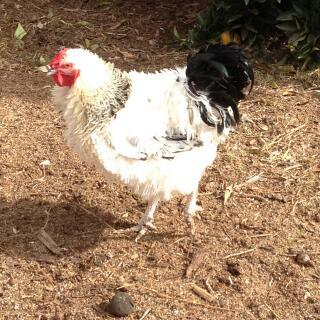 The large fowl was virtually extinct until a handful of enthusiasts recently started a breeding program to revive it. They are now considered to be a rare breed. Each feather is moderately long and curls backwards towards the bird\'s head. The individual feathers have a rather ragged appearance and the neck has abundant frizzled feathers. 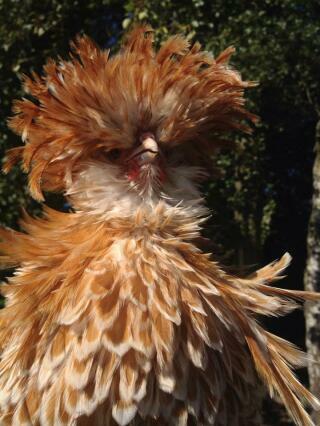 Frizzles are erect birds with short, broad bodies and a rounded full breast. 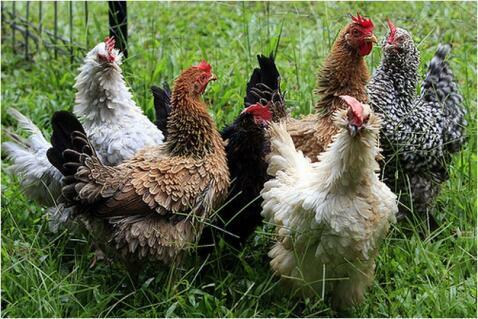 They have long wings and large upright tails and their legs are free from feathers. 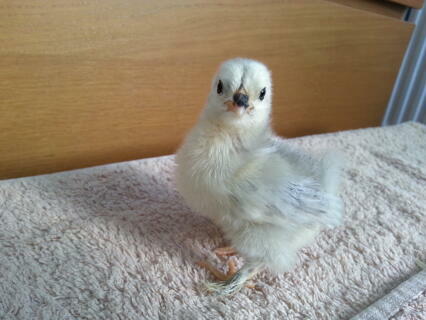 They are hardy birds which grow quickly. 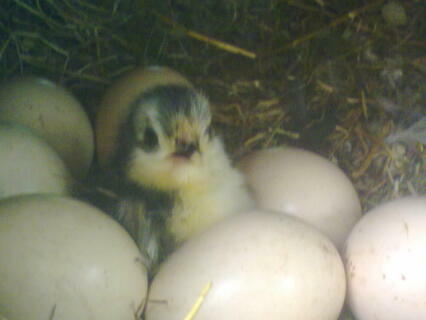 The chicks appear to be normally feathered when they are hatched but the wing feathers soon start to grow and turn outwards. 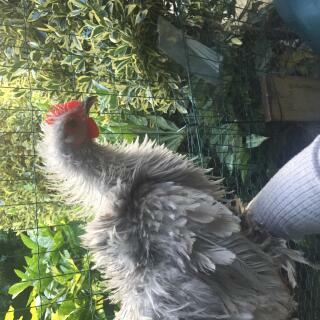 They are gentle birds and are good layers who don\'t sit particularly well. 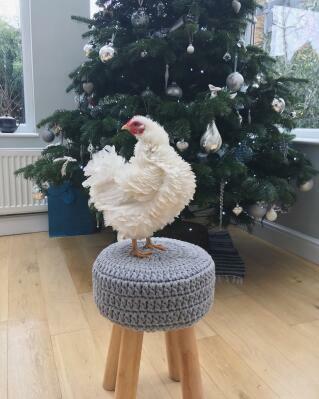 They are classed as a heavy breed and are often considered to be purely for exhibition but make good table birds and are perfectly well suited to free range or outdoor pens. 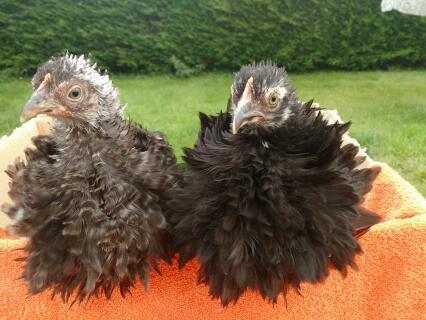 The Frizzle has been bred in several different colours :- self or single coloured black, blue, buff, white Columbian as in the Wyandotte, duckwing, black-red, brown-red, cuckoo, pyle, spangle as in the Old English Game and red as in Rhode Island Red. 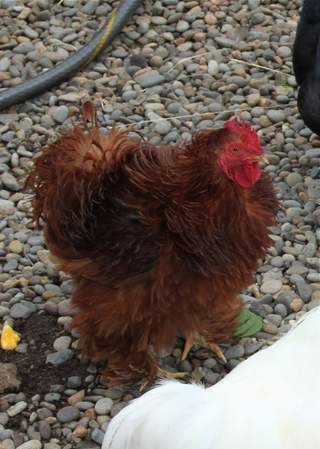 All colours have red eyes, a single, medium sized comb and earlobes but the leg colour varies and is usually darker with darker feathered birds. Beak colour also corresponds with feather colour, the buff, Columbian, pyle, red and white varieties all have yellow beaks while the spangle, black-red, cuckoo, black or blue have white beaks. 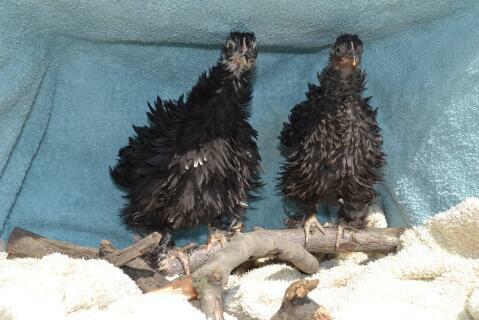 There are three types of plumage - frizzled, over frizzled and flat-coated. 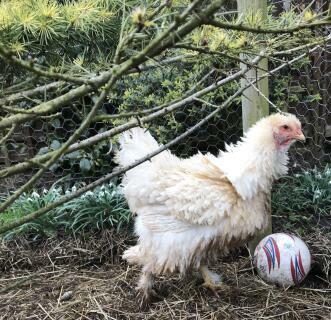 Exotic, striking, outrageously-glamorous birds when in top condition; or a woebegone mess of half-picked feathers and bare skin if a more dominant chicken (or chickens) takes them to task and the keeper doesn't catch a hint of the problem in time. 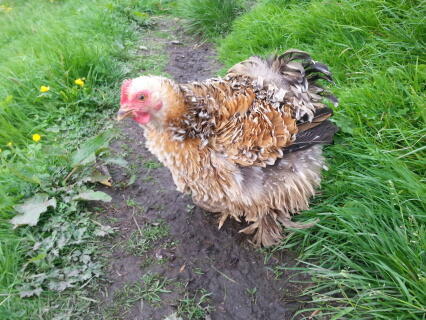 The lovely Frizzle can plummet from show-bird quality to a tragic little figure indeed in a matter of half-hour's time when there is a bully in the flock. I would love to give them five stars in every category, but---alas!---they are not for everyone. I have raised many of them over the years and have found visitors either love them or despise them. 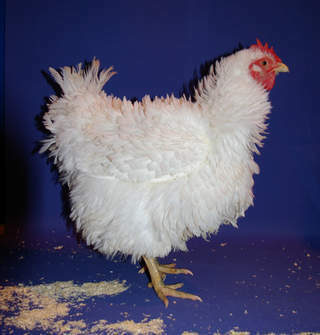 I've noticed a predominance in Cochins, Phoenix, Silkies, and Polish, although, as one of the reviewer's mentioned, they are not a specific breed but a feathering type that can crop up in any chicken breed. 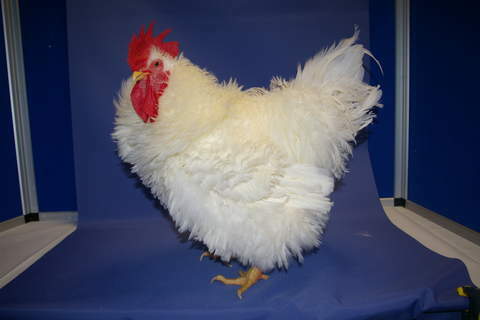 In my experience, the Frizzles, despite the breed or variety, are a bit more high-strung than the smooth-feathered birds of the same type. 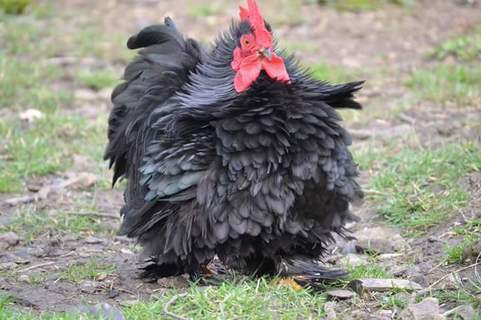 This may be because all Frizzles have a high-blood pressure condition; I believe I was first made aware of this in one of Brian Reeder's books on domestic fowl raising. 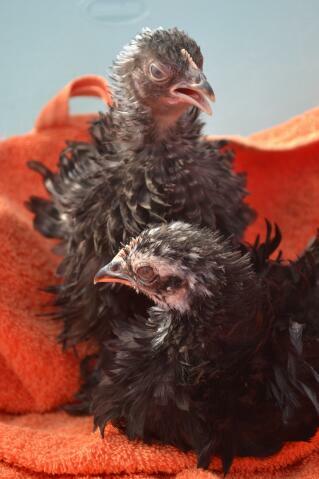 The high-blood pressure causes a slightly shorter life-span than non-Frizzled fowl. I have rated Frizzles as 3 out of 5 for friendliness due to the skittish nature I have noticed, although there have been exceptions, of course. 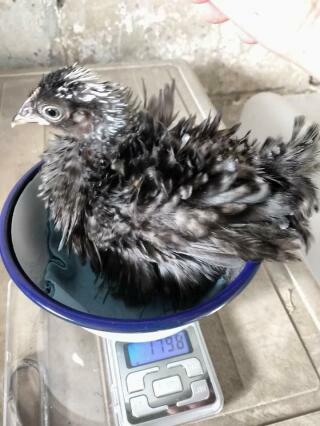 3 out of 5 for hardiness due to the need for extra heat and care when the chick is growing, which continues on to adulthood, adding in the high-blood pressure and subsequent effect on longevity. Definitely they need to be watched with extra supervision to maintain them at their best. 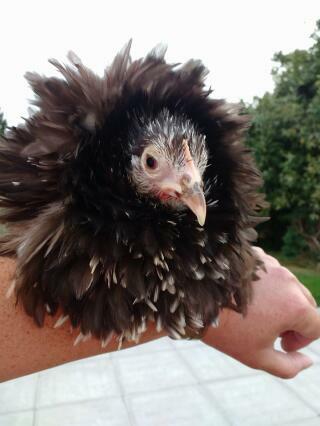 The birds that are characterized as "Frazzles" ---a double-dose Frizzle---are hard-feathered (non-intensives) and display more skin than is optimal. 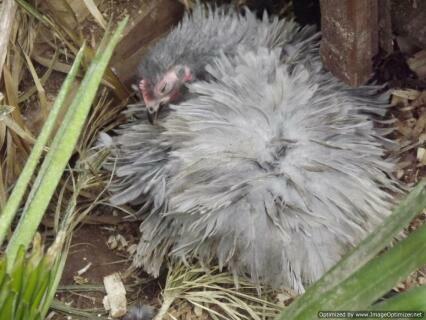 The "Sizzles" (Frizzle X Silkie ) are some of the more heavily-feathered of the Frizzled birds. These "Sizzles" show good consistency in feather curling, depth of color, and density; they are, in my experience, friendlier and calmer as well. 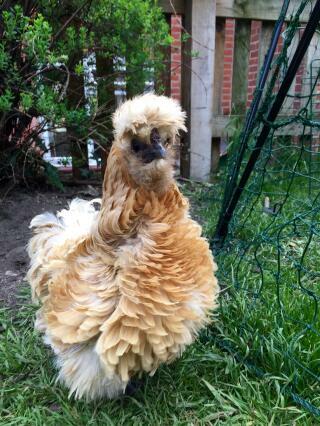 The Frizzling gene seems to have an interesting effect on some other aspects of genetic diversity; I have had many offspring displaying a "doubled" comb or a Buttercup-type comb when neither of the purebred parents had such a thing. Has anyone else noticed this? 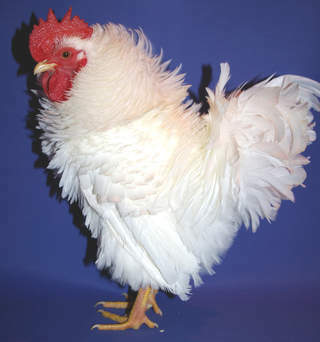 The roosters of the Polish and Phoenix breeds are outstanding in the crests on the Polish, and the neck and saddle hackle on both breeds when Frizzled. 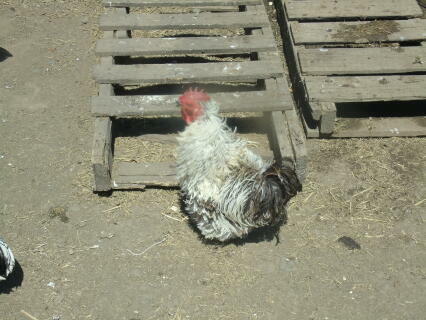 There is nothing more stunning than seeing a Silver-laced Frizzled Polish rooster in full, prime plumage---it will stop any poultry fancier in their tracks! Frizzles require more time and attention, but give back fabulous results. 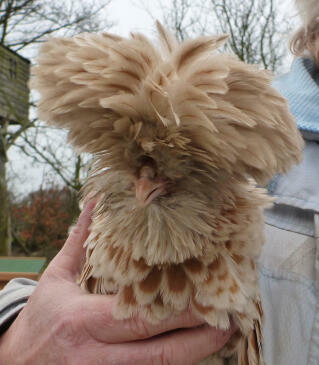 Fizzle chickens are NOT any one particular breed, but rather a gene/feather type. From reviewing your own description, it is obvious you don't know much about the birds. 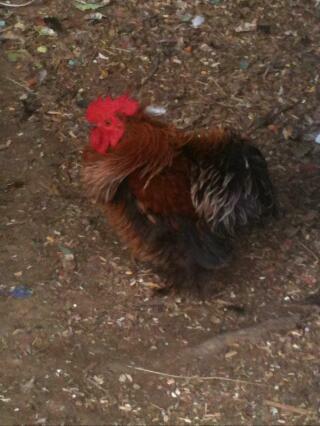 I have successfully raised large fowl fizzles for years and have to say they are lovely birds. 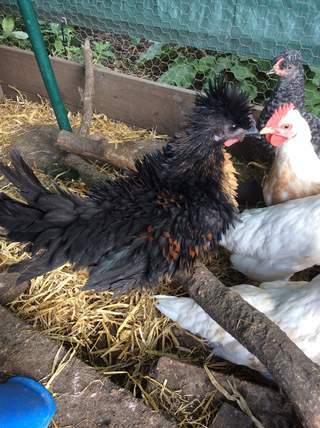 Most of my foundation stock consisted of Ameracauna, Aracauna and Australorps, producing majority black fizzle offspring. 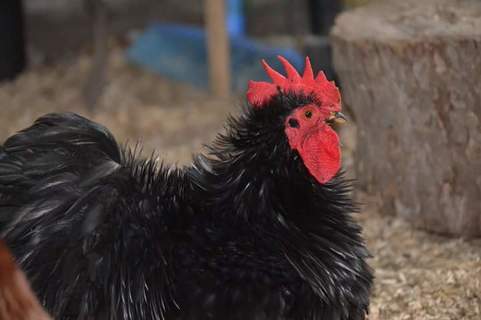 In recent years we have also been working with different breeds, i.e Dominique, Marans, Wyandotte, Welsummer, etc, successfully introducing more color and genetic diversity into our breeding program. I can say, from experience working with the gene, that fizzles are as variant and diverse as the day is long. 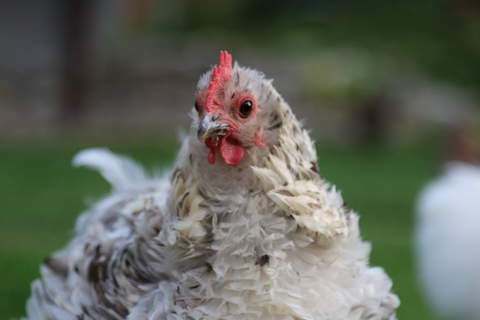 Depending on the parentage, we have produced fizzles with rose combs, single combs, red eyes, green eyes, etc, but ALL dominant fizzles have the same characteristic "backwards" curled feathers, regardless of the lineage. 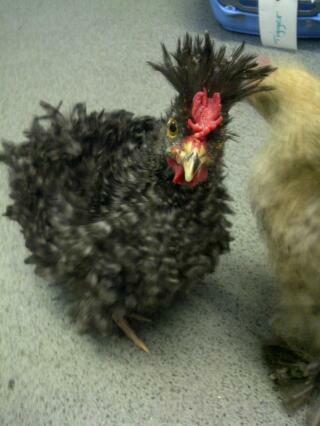 Without their curled appearance, though they may be a carrier, they are not a true frizzle. 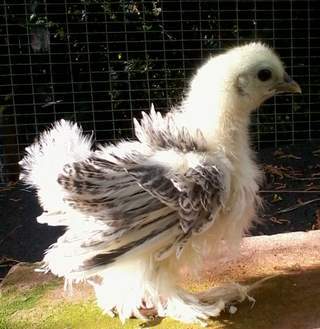 For those wanting to add these gorgeous birds to your flock, I would advise educating yourself on their specific needs (doesn't tolerate extreme cold and more succeptible to "pecking" injury as their feathers don't lend the best protection) and finding a reputable breeder with good, strong stock from whom to buy. they are very cute and a good family pet they are easy to look after and very friendly most of them love people some are OK tankyou from c.a.a .h.l.o. Friendly pets who get on well with the cat and can be quite vocal once they have laid their daily egg, one is a massive 48g! 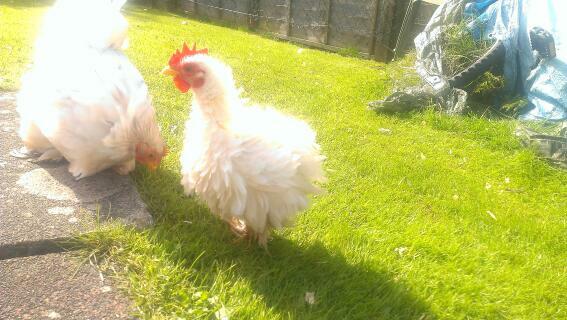 All three have gone broody but only one was allowed to sit. she spent 21 days in the cat box inside, and was taken outside for food and water once a day away from her sisters. 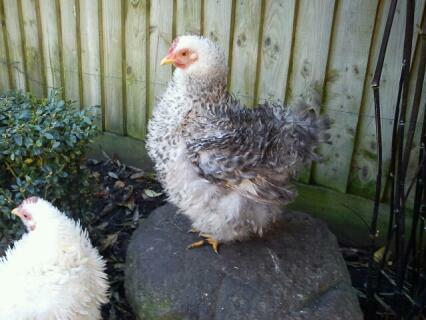 3 weeks later four beautiful chicks. I shall try and post photos but none I have submitted yet have been used.